Any firearm owner knows how precious is to own a gun or a rifle. However it has been seen that dust and dirt is always present in the environment which can form a layer on your sophisticated rifle gun. Also when you fire or shoot a rifle the residue of the gun powder remains in the barrel. Though the receiver and the chamber are clean, if you run a brush from the muzzle end you will find the gun powder and dirt particles hiding. And it is no doubt that if you do not remove these minute particles it makes the working of your rifle problematic. Perhaps this is the major cause of the rifle case being stuck or get into the problems with lever actions, loading and while shooting as well. Cleaning your rifle at regular intervals is the only solution to this! In fact regular inspection and cleaning of the rifle can keep it in a good working condition for a long time. But, for any novice, it may feel to be an intimidating task to clean a rifle in a DIY way. At the same time it is the most important thing you cannot ignore so that you get smooth operation whenever required. For making it bit easier for you, we have listed down some tips and steps by which you can easily clean your rifle at home. Do check them out to save your time, energy and money. How To Clean A 22 Rifle? How To Clean A Bolt Action Rifle? How To Clean A Semi Auto Rifle? The main aim, while cleaning your rifle, should not be to make it look good or shiny. The main purpose however lies in cleaning your rifle so that it functions smoothly whenever required. There are several kits, tools and solutions available on the market to clean a rifle. These can be used for the ideal cleaning purposes and to make your job easier and fast. However if you are a first time user and are looking for some specific tips on how to clean a rifle for the first time, you may need to do some research and follow strict rules. These are important so that you get desired results without any damage made to your rifle. 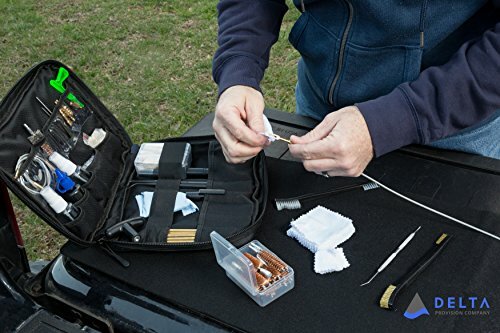 Pre-assembled rifle cleaning kits that specifically satisfy the needs can be used to clean a rifle in a best possible way. These rifle cleaning kits are already available in the market and you can get hold of one such kit from an online store such as Amazon. Cleaning your rifle at home can be an easy task if you follow all the rifle cleaning instructions properly while keeping the safety. Before going ahead with the cleaning process you actually need to know about the type of rifle (pump action rifle, lever action rifle, bolt action rifle, etc) you want to clean, the type of tools and solutions you will require for cleaning, steps involved and much more. Apart from the above mentioned tips, you can also consider buying an ultrasonic gun parts cleaner for cleaning the rifle and its parts at home. The ultrasonic rifle cleaner is a powerful device that creates tiny bubbles in the tank with the pressure that gets the gun parts thoroughly cleaned. These are excellent devices that gives you professional cleaning in minutes. These ultrasonic cleaners for gun parts and cases are widely available in the market and you can choose brands such as Hornady, Kendal, Lyman and many more that are as per your gun cleaning requirements. Disassembling and reassembling of the rifle is one of the trickiest step while cleaning your new rifle for the first time. It is best to refer disassembling and assembling guide that comes with your rifle model. If you do not have that, you may check online if you can get some guide or manual for same. Store your rifle properly after each usage so that you do not risk your family members. Use proper gun storage safe where it can be placed securely. Check more about the rifle cleaning, especially if you want bit extra than a regular cleanup of your rifle gun. Below are few useful videos that can help you out. Do check them out before you start cleaning your rifle.